Everywhere I go, I'm always discovering new beauty products and tips. And thanks to friends who travel and are nice enough to buy stuff back for me, from time to time, I get to lay my hands on some of makeup tips, tricks and hot items from other countries! My friend, Lynn, recently went to Thailand, and bought back these two Asian face powders for me, the Ponds Magic Powder, as well as the Thailand-based brand's Bhaesaj Teen Powder, both of which are extremely popular in Thailand, and have garnered a following in Asia as well. These face powders look like body powders, but they're actually used as face powders in Asia. Pretty neat, eh? I've actually reviewed the Johnson's Face Powder previously, so these powders are in the same vein as the one. 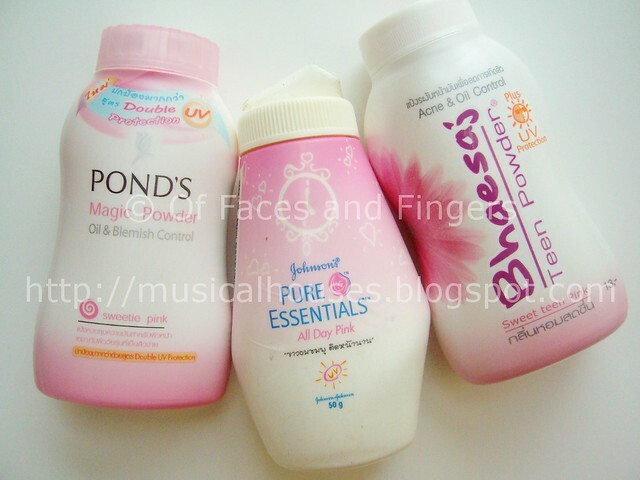 Here's a photo of my face powders, including the Johnson's one previously reviewed. I'm so excited to have hauled this, even if in proxy through a friend, LOL! I can't wait to start using and reviewing these! I've never used a face powder! I have no idea what they're supposed to do or are for. Being that I'm tan, i'd be afraid of them showing up as chalky on me. But for some reason I want to try them badly - they look as if they would smell good. Cool! I've never seen these face powders before! I just read your Johnsons one and it looks luminous! The Asian beauty market has all the best stuff!!! LOL! Have fun using them! I'm in the midst of using the Bhaesaj one, which has decent oil control for my shiny, disco ball face! the bottles are so similar. how do you use face powder in your routine? after foundation? @cushy: I don't use foundation, so I use the powder after my concealer to "set" it and give a more even finish. Hi! Came across your post while googling and one question is if make up removal is necessary for pond's magic powder at the end of the day or normal facial wash will be sufficient? Thanks in advance! P.S. Realized that this was posted 5 years ago but really hope that you will reply! Thanks for the reply, appreciate it!